NASA held a press briefing on the Dawn mission yesterday, sharing some new images and early interpretations of them. The new images include a total of 27 from the Rotation Characterization 2 sequence that I discussed last week, as well as their first global map made by combining these 27 images in a mosaic. I spent yesterday playing with these photos, trying to decide what to write about them. I see lots of things that intrigue me, and I'm looking forward to Dawn investigating them in more detail. There are lots of places where crater floors are not the shape I expect. There are lots of subtle linear topographic features that might not be related to craters, but it's hard to say. I'm hesitant to write about these subtly intriguing features, because I feel like I indulged in speculation enough in my previous post on Dawn's photos; it seems premature to try to draw any more conclusions. So instead of writing another lengthy post interpreting the images, I invite you to check out these photos yourself, and offer you some guidance on things to look for. First, just appreciate the full rotation animation. Take a moment to imagine yourself as Dawn, watching Ceres rotate leisurely below you over the course of its 9-hour day. 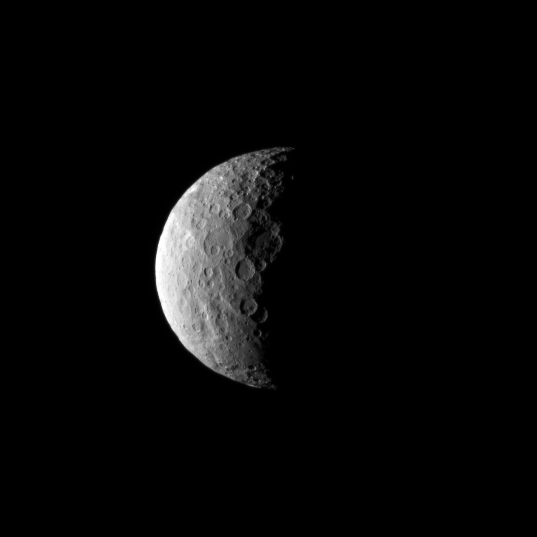 Dawn took 27 photos of Ceres during its Rotation Characterization 2 in order to make this animated view of the dwarf planet rotating. The publicly released version of this animation had been stretched to make Ceres' disk appear circular. Ceres is, in fact, quite oblate, so this version has had Ceres' shape corrected. At full size the animation has been enlarged to about 200% of its original resolution. I have modified the animation above from what was released on the JPL website. An astute observer at unmannedspaceflight.com noticed that the animation had inexplicably been stretched so as to make Ceres' disk appear circular, when in fact Ceres is much wider (975 kilometers) than it is tall (909 kilometers). I have rotated and resized the frames to match the proportions and orientation of this previous Dawn image release, although the match is still not perfect, suggesting that the Dawn camera team performed some additional kind of distortion on these images before releasing them. But the correction has made craters circular that did not appear circular in the official release, notably the crater containing the two bright spots. With that out of the way, what geographic features pique your interest? Here are some things to think about as you tour Dawn's latest views of Ceres. For all of them, focus on making observations, not inferences. This is one of the first skills I taught my fifth grade science students. Try to describe what you see without trying to explain why it is that way. Small impact craters should have simple bowl shapes with raised rims. Larger ones should have central peaks. If a crater does not have a raised rim or a bowl-shaped or peaked floor, something has modified it since it formed. In what ways do the craters on Ceres deviate from their expected shape? Over time, impact cratering should have covered the surface of Ceres evenly with craters of a variety of sizes. Do you see places where there is a lower density of craters than in other places? Do you see places where there are fewer large craters than other places? Do you see areas that are brighter than the rest of Ceres? How about areas that are darker than the rest of Ceres? Pick an interesting feature and follow it from image to image. What happens to bright or dark regions as the lighting and viewing angles change? How do bright or dark features relate to local topography? At the terminator (where the surface is rotating into nighttime darkness), the low-angle lighting throws topography into sharp relief. Are there places along the terminator in the images where you can see unexpected shapes in the topography? Anything that is not a round crater is unexpected. How would you describe the shape? Follow these features back into daylight; can you still see them? These images are not calibrated. Space and the night side of Ceres are black as they should be, but white pixels in these pictures may not be bright white features, they are just the brightest pixels in the image. So don't immediately assume "ice" wherever you see white pixels. It may just be less black than the rest of Ceres, which is very dark overall. Dawn's deputy principal investigator Carol Raymond did say at the press briefing yesterday that the brightest dot is still not resolved and could in fact be bright enough to be exposed ice or salt. But not all of the white pixels are that bright. These pictures are all enlarged from the original data. I have no explanation for why they do this, but they do it to all of their image releases, often sharpening the images, too. My version is about 200% of the original size. In general, you should avoid trying to identify or explain features in digital photos that are smaller than three pixels across. The enlarging of these photos means that you should avoid identifying or explaining features smaller than six pixels across; anything smaller than that was not well resolved in the original data. Here's another way of looking at the photos, a montage of all 27 frames from the animation. If you're able to view cross-eyed stereo, look at any side-by-side pair of images and cross your eyes to make it pop out of the screen at you. I see all kinds of interesting topography when I look at these photos cross-eyed! 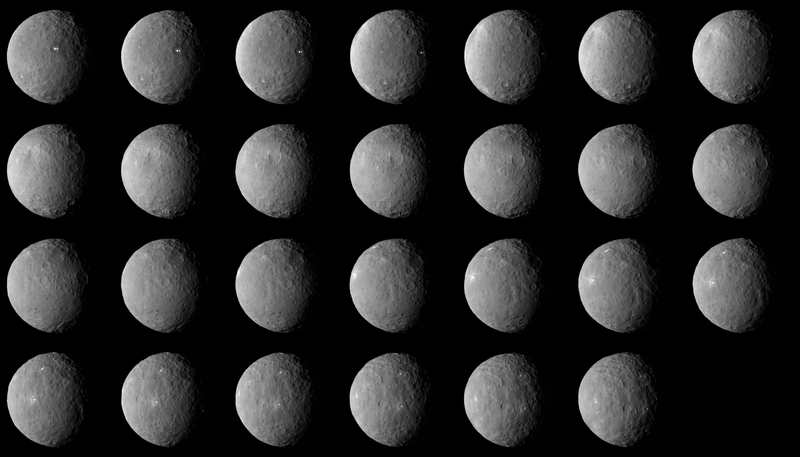 Dawn took 27 photos of Ceres during its Rotation Characterization 2. The images released by JPL were enlarged non-proportionally to make Ceres' disk circular; the versions here have been adjusted to return Ceres' disk to its oblate shape. Adjacent pairs of images can be viewed cross-eyed to simulate 3D. If you can't do cross-eyed stereo, this red-blue anaglyph may work for you. I find that it's just on the edge of being interpretable as 3D -- it makes my brain hurt a bit. In this animation, sequential frames from Dawn's Rotation Characterization 2 are displayed as left and right eyes to make a red-blue anaglyph. The 3D effect breaks down at the bright edge of Ceres, but some features can be seen to pop into 3D with the use of red-blue glasses. Finally, here is one more view of Ceres captured as Dawn began to travel to Ceres' night side, on February 25. Dawn is going to spend some time on the night side of Ceres, as Marc Rayman explains in his recent Dawn Journals from January and February. There should have been images taken on March 1 with only 23% of the disk illuminated. The next set won't be taken until April 10; that will see only 17% of the disk lit, a very thin crescent. Later in April, Dawn will finally get higher-resolution views of a more illuminated Ceres. Dawn took this photo of Ceres from a distance of about 40,000 kilometers on February 25, 2014. The resolution is about 3.7 kilometers per pixel. ..and so ends the "flyby" phase of the mission. I'm looking forward to hearing that it's been captured by the planet, or asteroid or dwarf or whatever in a few days. Now the question is when will the pictures get as good as Mars stuff we've been getting from the orbiters? Right now, what we've got are the quality of the Voyager, or the stuff done by Cassini for "artistic" purposes. Will we be getting photos that will tell us what the white spots are before New Horizons gets to Pluto? ...and on an extremely shallow note: Are Mark and Carol Raymond related? Emily, Is this "complete" rotation actually only 85%-90%? The "Two Spot" white feature never makes it back to the left of where it began in the first frame. Thank you so much for the fascinating article and the idea to post the montage while suggesting we view it in cross-eyed stereo. I am pleased to report I saw far more detail and some very interesting features looking at it this way. I will be coming back to this image and examining it multiple times, to be sure. It seems to me that I'm seeing some surprisingly flat and relatively craterless plains, especially in a portion of Ceres' southern (? I am assuming the images are oriented with north up) hemisphere. I suppose something is selectively flattening out some parts of Ceres' surface, but if it's non-tectonic, then what? And why wouldn't the flattening be equal on all parts of the surface? In the first image (top left) , near the south pole, roughly same longitude as the bright spots, there's an interesting structure with a dome in the middle. You can tell it's a dome because you can still see the top on the terminator in image 4 from top left. From it some sort of channel departs in the north direction and it can be followed for nearly a quarter of the globe. It looks nothing like the other craters. There's also a black spot in the center of the dome, visible on the first two images. I saw the same thing as David. The Northern hemisphere seems to have more cratering. @David and Jonathan, the apparent lesser cratering in the southern hemisphere may just be due to different illumination. If you watch the craters as they are about to enter the night side of Ceres, they look more prominent because they are being lit from a shallower angle. I threw together a tool to calculate heights of features based on when they pass by the terminator: https://docs.google.com/spreadsheets/d/1WmjWA7XCYkRIJ0Q8Lzq2USXSWhFQKFqOooRKREOAyto/ The inputs currently shown are intended for the bright spots that've been a keen focus for many. If the inputs I'm using at present are correct (admittedly a big "If") then I measure the height of the bright spots to be 1.8km (?) Code is posted in the spreadsheet to make an easy copy/paste for people to try their own (and presumably better) inputs, or to apply to other features. I have been looking at the rotation images over and over again. The more I view them, the more extraordinary the 'bright spot' becomes. There are other bright patches, but these are mostly in sunlit crater rims; their albedo changes with the viewing geometry. The bright spots are bright all the time, and continue to shine well past the terminator. If they are reflecting light, then they have to be on peaks which are surprisingly tall for the topography of Ceres. A tall central peak is not surprising for a crater (though this would appear to be the only one this prominent on Ceres) but the offset bright spot is more difficult to explain. Excavated bright material could explain other light patches, but I don't see how one 'excavates' material to a mountain-top. Thanks Emily for your hard work in putting together the rotation gifs, especially the red-blue anaglyph. They really show the features nicely. The Keck images from 2002 in http://arxiv.org/abs/0711.1152 (wikipedia's citation for the mass) show something which looks a lot like the mysterious bright spot. Their 'feature A' anyway looks like the right size and latitude for the two bright spots in the crater. Less sure about their 'feature B'. I wonder if we know the rotation rate accurately enough to compare the observed longitudes? That paper measures a 9.0741 hour period, which isn't enough precision to evolve timing forward over the ~12k rotations since then if there haven't been follow-up observations. Does anyone know if any of the "bright spots" were captured on the dark side when the north pole navigations photos were taken?